Halifax bounced back from last weekend’s loss to Bradford with a comfortable 32-6 Championship win at Workington. Despite missing a string of players through injury - including the on loan Widnes stand off Danny Craven - Richard Marshall’s side never looked in danger on the Cumbrian coast. The visitors were on the front foot from the kick off, back rower Ross Divorty bursting down the right and centre Ben Heaton backing up on the outside for his 12th try of a productive season. Captain Scott Murrell kicked the conversion and Halifax continued to pile on the pressure until they finally cracked their hosts again in the 19th-minute, winger Gareth Potts claiming Murrell’s cross kick and twisting over in the corner. 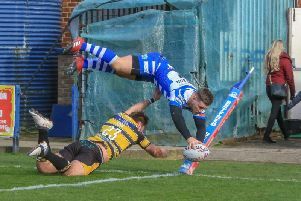 Town never really looked like establishing a foothold in the game and Halifax were over again on the half hour, Dane Manning touching down under the posts after full back Jack Murphy had spilled a Murrell chip kick. Murrell converted again for a 16-0 scoreline, and although the visitors undermined an otherwise excellent half with a series of errors they got the reward their performance merited just before the break when half back Ben Johnston backed up a James Saltonstall break down centrefield. Potts added the conversion to make it 22-0 and the winger was over again at the start of the second half, Murrell slipping him clear down the right flank. Town finally got themselves on the scoreboard when Wigan centre Rhodri Lloyd touched down after 49 minutes, Carl Forber converting for a 26-6 scoreline. The rest of the half was a scrappy affair, but a late try from Mitch Cahalane, converted by Potts, sealed a win that was a lot easier than the score suggested.